Its a bright, brave new world for orchids. As the millennium approaches, we are hearing terms seldom, if ever, used before in reference to orchids: big box, mega-nursery, branding, product, sell-through, shelf-life, buyer and value-added have entered our vocabulary, for good or ill. Mass-marketing has truly hit the orchid world. Is it a sign of the times, or the mark of the demon? Will the dramatically increased availability of reasonable-quality orchids help or harm the orchid hobby? Can smaller, specialty nurseries  long the trades lifeblood  successfully compete against often cutthroat competition from the largest mass growers? Is it a problem or an opportunity? The short answer is: It depends on whom you ask. If it is a problem. As more of the public become accustomed to orchid flowers, the cachet will be lost. No one will be interested in actually growing orchids any more, as they are so cheap and readily available that it is just easier to buy one in bloom. The smaller growers will be forced out of business by unfair competitive advantage. All specialist interest will be lost to ever-increasing product uniformity. The hobby will die as a result. If it is an opportunity. As the public becomes increasingly aware of orchid flowers, some proportion is bound to become hooked. This group, fascinated by the challenge of growing orchid plants, will revitalize the specialist-nursery trade, as well as the AOS. Smaller growers will become more profitable, as the demand for more unusual plants grows. The need to create new mass-market types will result in more and better hobby-oriented orchids as a byproduct of increased breeding and selection. The hobby will grow by leaps and bounds, and longtime hobbyists will have a better selection of better plants at better prices than ever before. The increased profitability of the industry will drive new research into improved methods and materials, leading to a renaissance in orchid culture. 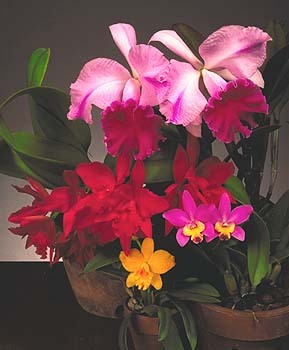 Cattleyas, which are among the most popular orchids, come in many colors, shapes, forms and sizes. Many even have fragrant flowers, although their scent is less noticeable when they are cut. Cattleyas are epiphytes or air plants that have developed water-storage organs, called pseudobulbs, and they have fleshy roots covered with a spongy, water-retentive velamen. They are accustomed to being dry at the roots between waterings, and should be potted in free-draining media. It is an opportunity beyond compare: new orchids, new methods, new friends. Of course, any opportunity is not without its pitfalls, its costs. Hobbyists, new and old, can take advantage of the situation. They can exploit the system to build their collections of quality plants at reasonable prices. As the industry undergoes rapid growth, the days when just about any orchid in flower was salable are essentially over. Mass vendors are demanding good-quality plants, well grown, properly and clearly labeled, handled and delivered with care. Gone are the days when poorly handled, weak plants missing flowers and buds were the norm. Some growers still repot their plants immediately before shipment. They feel that this enables them to provide the cleanest possible product, as well as to respond rapidly to the vendors packaging demands. It also keeps their costs down, resulting in low final pricing. Many others ship only plants well-established in their pots. However, many use other than traditional orchid mixes such as fir bark. Many use variants of peat- or coir-based mixes similar to those used on other flowering potted plants. This can cause other problems for orchid hobbyists. Because most mass-marketed plants are expected to be sold immediately, they are shipped with open flowers. This, of course, is the most vulnerable stage of floral life and improper handling can result in damaged flowers. The distribution process itself places a great deal of stress on the plants at a time when the flowers are already a source of additional stress. And if the employees at the point of sale do not take the proper care in unpacking the orchids or do not care for the plants after unpacking, youve got a group of stressed plants on their way to wastage; as well as very poor candidates for purchase. Growers are quickly realizing that it costs no more, and often less, to grow superior clones. The advent of modern and efficient tissue-culture labs overseas has driven the cost of selected meristem cultivars to, in many cases, actually less than seed-grown plants. It is fairly easy to see why, if only for the uniformity factor in mass culture. 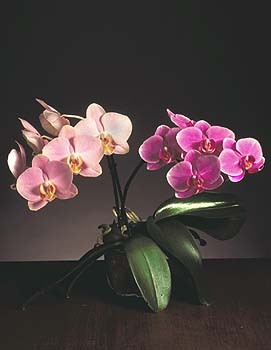 Of the three or four major types in this league, phalaenopsis remain the exception, with a majority of the plants being grown from seed. However, both Dutch and Taiwanese growers are pushing this percentage down with the increasingly efficient production of meristem phalaenopsis. Dendrobium is a genus of diverse orchids with different cultural needs. The phalaenopsis-types, shown here, are commonly seen in supermarkets and in garden centers. Many are potted in a soilless peat-based mix, such as bark chips or tree fern, that requires watering less often than other media. Compact hybrids, which are sometimes potted several plants to a container, are suitable for growing under lights and on windowsills. Dendrobiums grow better when allowed to become potbound. for ease of flowering; for a good spike when the plant flowers for the first time; for disease resistance; for quick propagation; indeed, for many of the same things that hobbyists want in their plants at home. We all want plants that make an attractive display easily and at the same time each year. Rather than having to rely on luck in getting a good-growing plant from a mail-order source, or a reliable flowering plant from a local nursery, the mass-market growers are doing it for the hobby growers. I am not implying that smaller orchid nurseries dont have a place in this process. They do. There are many, many extraordinary plants that simply do not have wide commercial appeal, even though enthusiast demand remains high. This type may also be a little harder to grow, or a little slower. Here is where the service-oriented specialist orchid nursery can more than compete, it can excel. Ironically, the smaller specialist nurseries are often the source of the most successful mass market types because they are more willing to grow a few plants for testing. 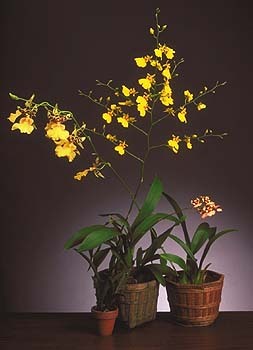 The hobbyist can exploit the mass market by taking advantage of the most commonly available types of orchids. 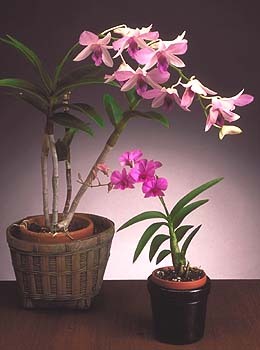 By far the most commonly seen will be dendrobiums, usually phalaenopsis-types, and phalaenopsis. Oncidiinae hybrids, such as Oncidium Sharry Baby and Colmanara Wildcat, are making a strong run, and are justifiably popular with their wide array of exotic patterns and shapes. Paphiopedilums and cattleyas are seen as seasonal fillers, and vandas and cymbidiums are also seen in areas that favor their growth. When shopping, remember that a bargain price is not always good. In fact, usually not. The same criteria for plant hybrids, such as Oncidium Sharry Baby and Colmanara Wildcat, are making a strong run, and are justifiably popular with their wide array of exotic patterns and shapes. 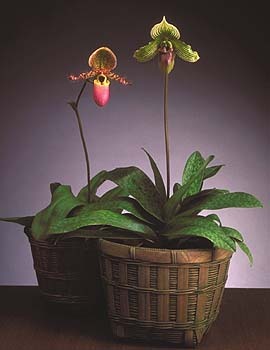 Paphiopedilums and cattleyas are seen as seasonal fillers, and vandas and cymbidiums are also seen in areas that favor their growth. When shopping, remember that a bargain price is not always good. In fact, usually not. The same criteria for plant and flower appearance you would use at an orchid nursery or at an orchid show should be used. If the plant looks weak, has poor roots, is wobbly in the pot, has damaged or missing buds or damaged foliage, and no label, chances are it has been poorly handled somewhere along the line and is a poor value. On the other hand, if the shipment has come in today, has been properly handled by the staff, is well rooted and firm in the pots, with attractive and well-presented flowers, as well as the bonus of a legible label, you may have found a bargain. Paphiopedilums, the ladys-slipper orchids, show variation in their foliage, which also indicates their temperature needs. Those with mottled leaves require 60 to 65 F during the night and 75 to 85 F during the day. The cooler-growing green-leaved types should be kept at 50 to 60 F during the night and 75 to 80 during the day. However, many growers raise all plants in the same temperature range with excellent results. Paphiopedilums are easy to grow in the home, under lights or in the greenhouse. Oncidiums are native to the New World Tropics, originating anywhere from sea level in the tropics to the high elevations in the Andes. This makes cultural generalizations difficult. Thin-leaved plants require watering more often than those with thick leaves. Where space is limited, try the equitant oncidiums, called tolumnias by some growers,which require bright light and warm temperatures. A chocolate fragrance is offered by Oncidium Sharry Baby, which is readily available due to mass marketing. Whether a dendrobium, phalaenopsis, oncidium-type or other orchid, the cultural dilemma remains. Whether shipped from around the block or across country, handled well or poorly, the plants have been stressed. You have made your selection, sensibly of course, and gotten your flowering plant home. Occasionally you will get reliable information at the point of purchase. More and more of the big-box-type retailers are making the effort to hire experienced nursery workers, but experienced orchid growers are rare. More often than not, the plant will be potted in a mix unfamiliar to the buyer. The plant may have been recently repotted into a clean pot, or new basket, with fresh media, resulting in root disturbance. Even if not, shipping often causes jostling that loosens the plant in the container and may cause some root disturbance, as well as the unfavorable conditions that usually exist while in transit. The plant is in full or nearly full bloom, a time when all available reserves are being used to support the showy blooms. If it has been at the point of purchase for any length of time (remember, the best time to buy is the day the plants come in), it will have been under less-than-ideal conditions in the vendors display area. Last, it is intended for duty on display in your home, never the best place for a flowering orchid in the best of circumstances. This is not a problem for the buyer not inducted into the mysteries of orchid growing. They have simply purchased the plant on impulse, because it was pretty and seemed to be a good value. This buyer will treat the plant as an arrangement. For this purpose, a flowering orchid plant is an exceptionally good choice. When the flowers fade, they will simply discard the plant. Hobbyists, however, want the plant to survive the ordeal of flowering this year to flower again another year. The purchaser needs to balance the aims of best display value with the good of the plant. Phalaenopsis, the moth orchid, is perhaps the best orchid suited to growing in the home, and is also a favorite with greenhouse owners. The main flowering season is late winter into spring. Flower stems on certain hybrids can be forced to rebloom by cutting the tip off after the initial flowering. Only healthy plants should be induced to flower repeatedly. Doritaenopsis, an artificial genus between Phalaenopsis and Doritis, requires the same culture. All flowering plants can be treated about the same in this scenario. First thing after bringing the plant home, have a good look at its condition, even if you did so when you bought the plant. If the plant is a little loose in the pot, tamp it down moderately to resettle and firm up the mix. If the plant needs staking, or at least retying to the existing stake, to hold it steady, do it. If the flower spike needs restaking to secure it and make the flowers display themselves better, do that, too. The plant will need water to support the demands of the flowers, but if the roots are severely damaged or lacking, no amount of water will help, and may indeed lead to rot. The safest bet is to keep the mix evenly moist; that is, allow to nearly dry between applications of water. The best thing you can do for this plant is to try to add a little humidity to the atmosphere. If the plant has been repotted before shipment and the mix is covering the rhizome, remove some mix until the rhizome is exposed. Display it where there are other transpiring plants around. Avoid setting it on top of the television or in front of an air conditioning register. Air conditioning is one of the harshest things on indoor plants as it is drying. Some natural light and air movement will help, but is not a necessity. Natural light makes the flowers and plant look better to the eye, but is not strictly needed. As the flowers begin to fade, remove the flower spike entirely and put the plant where it will grow best, whether in the window, under lights or in the greenhouse or patio. Yes, remove the flower spike entirely. This will give the plant the maximum time to establish and grow for next year. Cut it all the way off and give the plant a chance to put its energy into growing new roots and leaves. If it is a phalaenopsis, next year you can leave the spike on to branch if youve done a good job this year. Yes, by all means, take advantage of the new mass marketers. But, as with any other purchase, caveat emptor. And join the American Orchid Society. Ned Nash is director of conservation and education at the American Orchid Society. Ned previously worked for 20 years at Stewart Orchids in California. He writes frequently for Orchids and authors the "Question and Answer" column.  6000 South Olive Avenue, West Palm Beach, Florida 33405. These orchids are prized for their long-lasting sprays of flowers, used especially as cut flowers or for corsages in the spring. 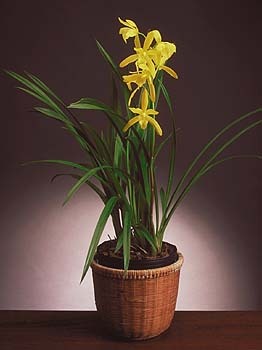 There are two main types of cymbidiums  standards and miniatures. Where summer nights are warm (above 70 F), only miniatures can be recommended, because many are more tolerant of heat and able to flower in warmer weather. A bright and cool location inside is best for the winter months. Repot every two years or when the potting mix decomposes. Copyright © 1999 American Orchid Society. All rights reserved.